Hello everyone! Today on the blog, We will share with you a few of my favorite wedding venues in Goa and my honest opinion of what is good about them and what is not as good! 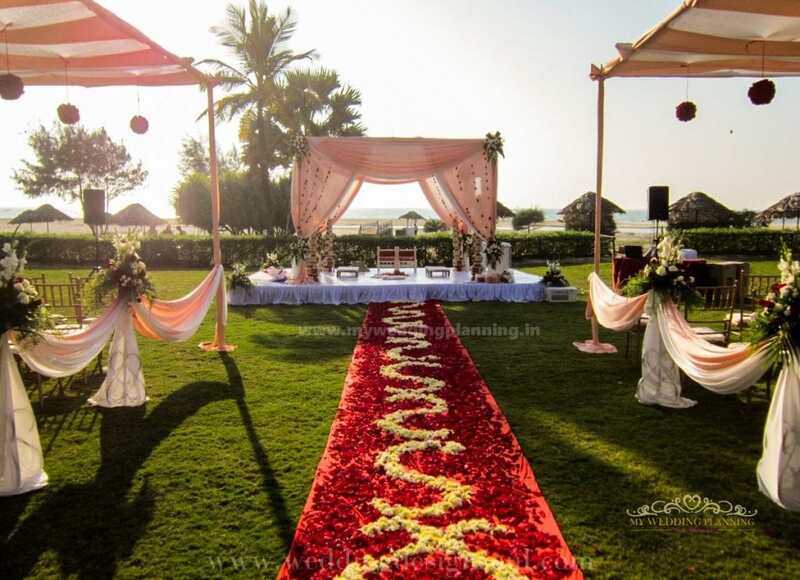 Selecting the right wedding venue is one of the most important decision in the wedding planning process. The wedding venue is what sets the tone of the wedding to follow. One needs to do a bit of research before finalizing their wedding venue. 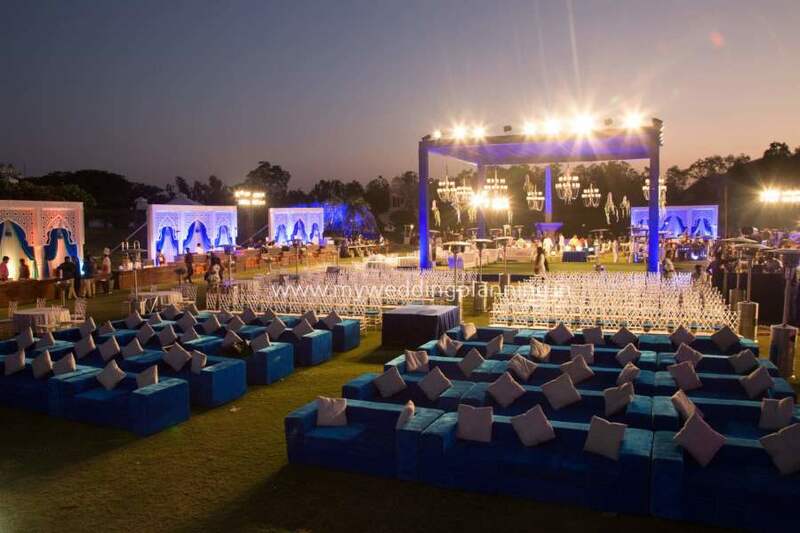 Over the last five years, We have worked with most of the wedding hotels in South Goa and have formed an opinion of the pros and cons of hosting a wedding at these venues. 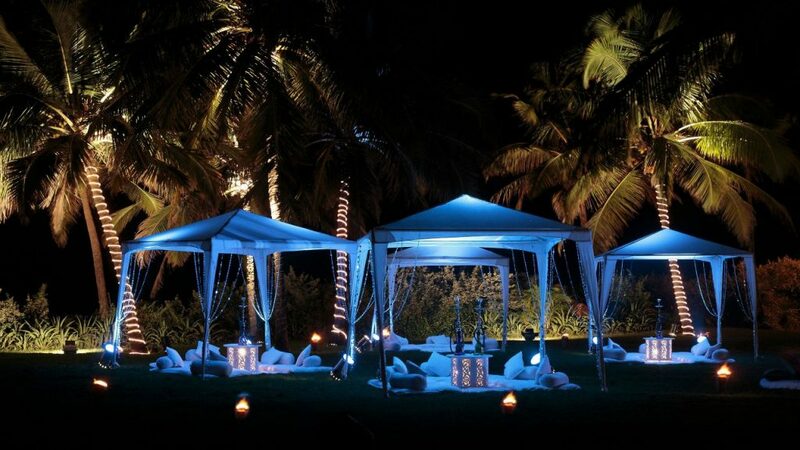 Here is our list of Goa’s most magical destination wedding venues and their inside secrets! The best part about Radisson Blu has to be its lavish spread and delicious food. Whether you’re looking at Indian fare or European Cuisine or Gourmet Mexican dishes or rustic Goan fare- Radisson will exceed your expectations. Known for their amazing buffet spreads, Radisson tops my list of wedding venues in Goa that serve great food. Also, their desserts are literally icing on the cake! Chef Mahesh goes all out to make wedding clients feel at ease and is sure to extend the menu by a few dishes as compared to what was agreed upon in the contract. Sheer delight! The rooms at Radisson are spacious and well equipped with amenities like a hair dryer, iron board, good quality toiletries. It is a cosy property with 132 rooms. Radisson usually takes up wedding groups with 50 plus room requirements. This November I did a small 30 room wedding with them and they still cared for my clients in the same way that they do when a 130 room client comes to them. Radisson has an adjoining sister concern Dona Sylvia which has more than 100 rooms. Dona Sylvia usually does not host weddings and is more of a leisure property. However, if your room requirement is large, you can put up guests at Dona Sylvia as well as Radisson and host all your events at Radisson. Radisson has a lovely ballroom with chandeliers and gold accents. It is my personal fav in Goa! They have a few more indoor venues for smaller functions like Lucio and the Coffeeshop terrace. Drawback of Radisson is that it is not a beach property. One has to walk through Dona Sylvia to reach the beach. However there is no boundary between Radisson Blu and Dona Sylvia. Radisson to the beach is a 8 minute walk. Cons: Not exactly a beach property as the beach is a 8 mins walk from Radisson’s lobby and one has to walk through Dona Sylvia which is now Novotel. 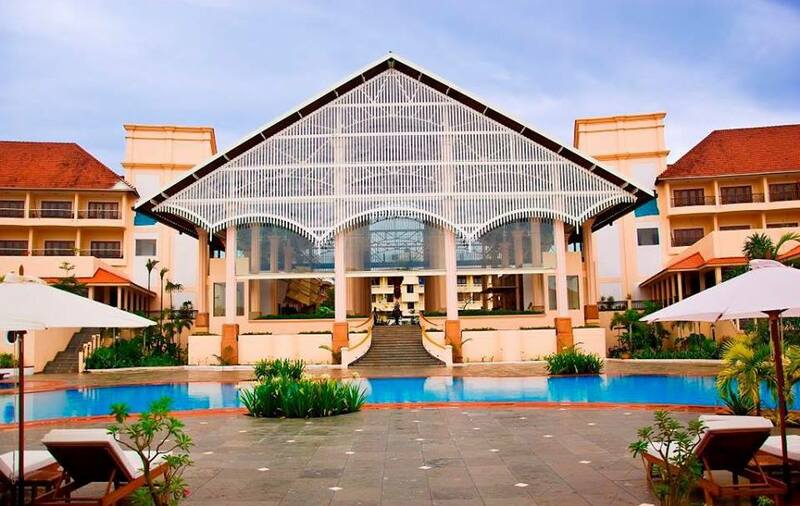 Ramada Caravela Beach Resort is a 205 room property at Varca Beach in South Goa. If you have a guest list of 200 or more guests and are looking to have most of your functions outdoor, then Ramada has to be the ultimate venue! Ramada has many beautiful lawns and is a 25 acre widely spread out property. It also has a pristine white sand beach with an adjoining concrete shack area. The shack area is perfect for a rain dance party and the beach is an amazing venue for a wedding ceremony. Ramada’s lobby has the perfect Portuguese vibe and is grand to look at. Drawback of Ramada is that its ballroom is good enough for maximum 250 guests. If you have a guest list of 350-400 people, it will become very congested. 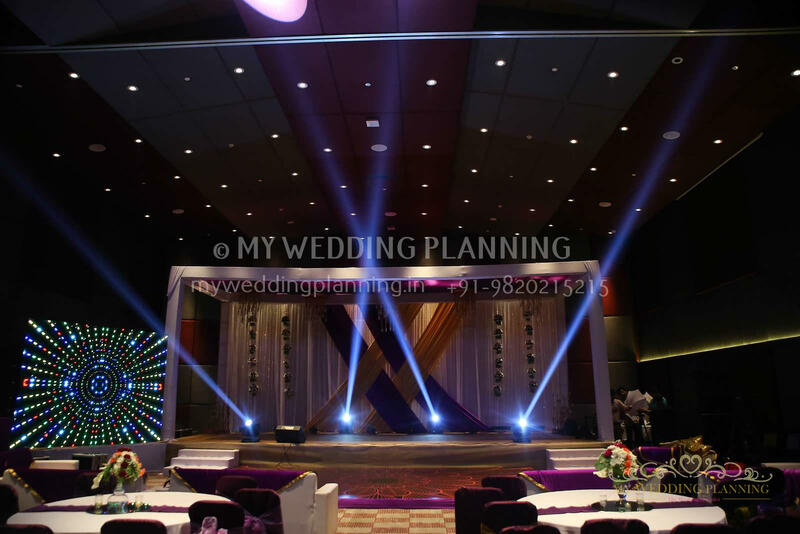 Also, the ceiling height is low and hence the stage backdrop has to be of lesser height (9 feet max) and you cant make it look grand for a sangeet night or reception party. Pros- Great rooms, good food, big inventory of rooms, amazing outdoor spaces, beautiful pool side area. Cons- Too big for a small wedding, guests will get lost in the property. Ballroom is too small for a big fat Indian wedding. 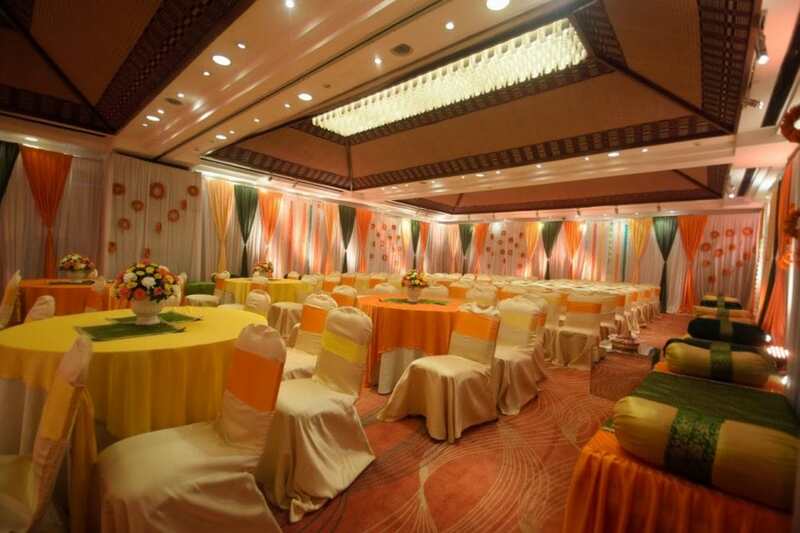 Right size for a wedding in Ramada is 200-250 pax. Holiday Inn is like my second home. I have done so many weddings with Holiday Inn that I know every corner of this lovely property. The best part of Holiday Inn is its lobby and wedding venues. As soon as you enter the lobby, you can see the beach. The property is horizontally spread out so the beach seems much closer than it does from other properties like Ramada and Radisson. Fig And Olive Lawns, Arabian Lawns, Off-the-bridge Lawn, Ballroom, Carnival Hall are all wonderful wedding venues. Holiday Inn is perfect for a wedding of 100 plus guests and up to 400 guests. Holiday Inn offers good wedding service. The beach is one of the best in Goa as it is clean, white sand and flat. The pre function area of the ballroom is air-conditioned so guests can eat their meals in a cool environment. Drawback of Holiday Inn is that though it is a 5 star hotel, the rooms are 4 star. They look a bit old and not as grand as the ones at Radisson and Ramada. Cons: Rooms are 4 star, definitely not 5 star! Zuri White sands is a classy property. Its got a meandering pool that passes through most of the property. It also has an additional small pool, that is available to you if you book more than 80 rooms for your wedding. Zuri’s lobby may be a tad bit underwhelming, but its not bad. Zuri also has a Casino that is sure to distract your guests! The hotel has 2 ballrooms and the bigger ballroom also has an adjoining lawn so you have an option of where you’d like to host your indoor event. The beach is nice, but has its problems. There is a river that flows through the beach in the monsoon season that leaves its dents on the beach through the year and makes the beach a bit uneven. The biggest drawback of Zuri is that its food is not as great as the other 5 star hotels in Goa. So if yours is a Gujurati, Marwadi or Punjabi wedding and your guest have high expectations- they may be a little underwhelmed with the food by the end of the wedding! Be aware! Cons: Food is not as tasty as it is in other 5 star hotels! 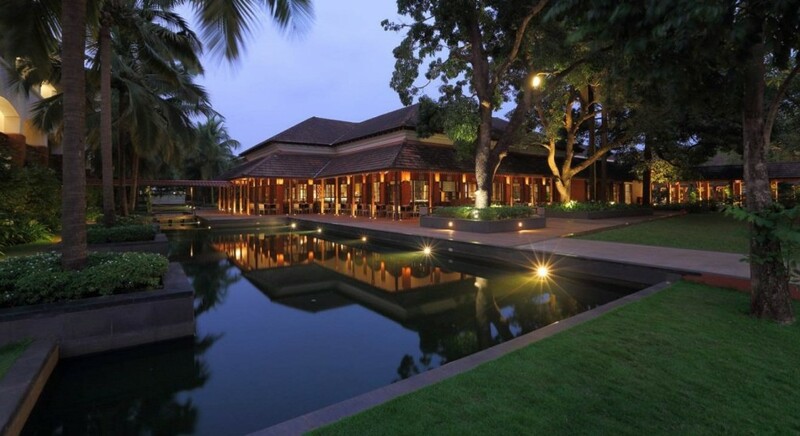 Park Hyatt is Goa’s most sought after venue. Its is the crème-de-la-crème of Goa venues and hosts most of the big fat Indian shaadi’s in Goa. And there is a reason why. Park Hyatt will blow you away with its beauty. Whether its their sea facing lawn or the gorgeous forest lawn- you’ll be spell bound. The pool is breathtaking and the villas are true Goan gems. Brightly colored villas and acres of manicured land that has been well maintained is what makes Park Hyatt of the standard it is. Good rooms, a decent indoor ballroom and a possibility of a beach wedding excites all who come here to get married. The food is good too. 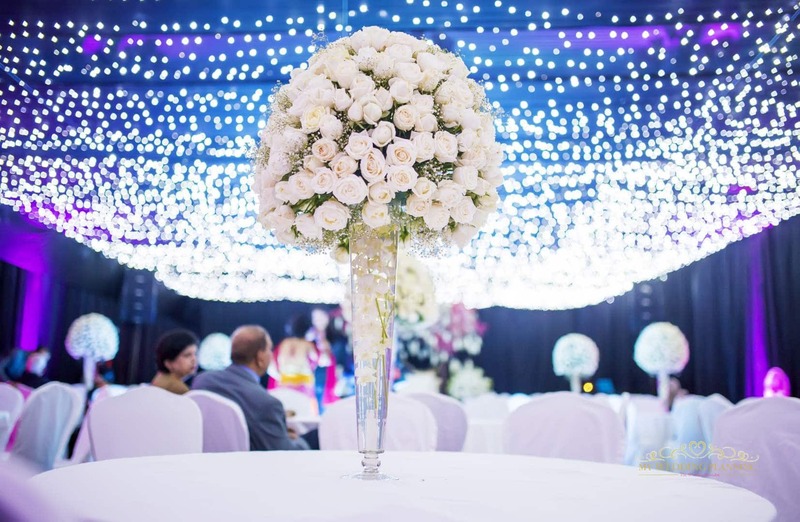 The drawback of Park Hyatt is that they are a strict and rigid property and do not go over and beyond to accommodate your requests as a client who is paying a hell lot of money to get married at their venue. They do not allow outside alcohol. They will not extend the music beyond permissible times. And worst of all, the will not negotiate a good rate on bulk bookings. You will end up spending double at Park Hyatt as compared to other five stars like Ramada and Radisson. You will have to pay extra for each and everything starting from venue rentals for outdoor spaces. Management is rigid and difficult to bargain a good discount with them for rooms and meals in lieu of big business that is coming their way because of more rooms being booked for a wedding. If you’re looking for a big fat Indian destination wedding, Grand Hyatt is a great choice. It has a huge inventory of rooms and perfect for a 400-600 people wedding party. Spacious well equipped rooms, grandeur all around and everyone can be at one place as the property is not as spread out as the other hotels. The biggest advantage of having your wedding at Grand Hyatt is its ballroom. Grand Hyatt has a 12000 square feet huge ballroom which is perfect for a grand sangeet night or reception dinner. However, Grand Hyatt does not have its own beach and the wedding would have to be on a beach facing lawn instead of on the beach itself. Cons: Not a beach property and very expensive in the peak season. Cidade de Goa is Goa’s first five star hotel. You can see the beach from any corner of this property. Cidade has a nice Portuguese feel to it with its brightly colored walls to its architecture. It has a lovely pool and good venue options both indoor as well as outdoor. 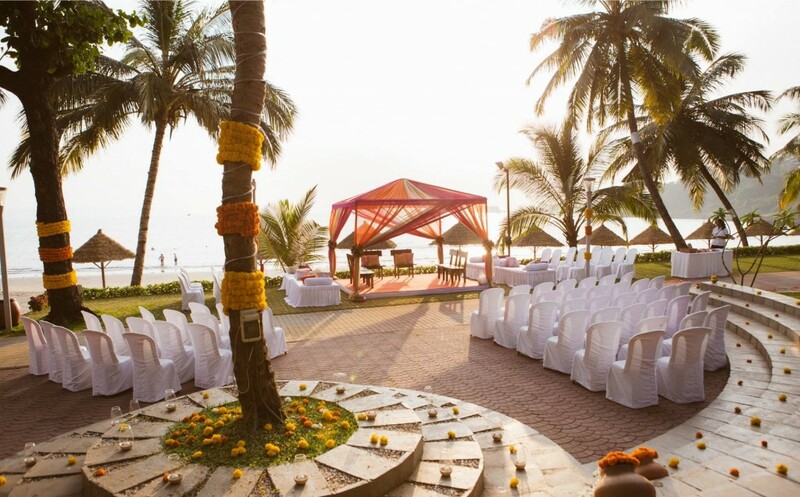 A beach wedding is possible at this venue, but the beach is busy as compared to the ones in South Goa. If yours is a Sikh Wedding, then Cidade is a fantastic option as the Betim Gurudwara is nearby and convenient for guests to travel to for the wedding ceremony. However, since is an old property even though it is well maintained, it gives you a feeling of being a tad run down. Cons: A little run down and old property. Lalit Golf and Spa is an 85 acre property at the far south end of Goa. It has a huge inventory of rooms and can host weddings of 300-700 guests. The property has 255 suites and 9 villas. It has 2 beaches, 2 huge wedding lawns and ample other outdoor options to choose for your mehendi, haldi and other pre wedding functions. 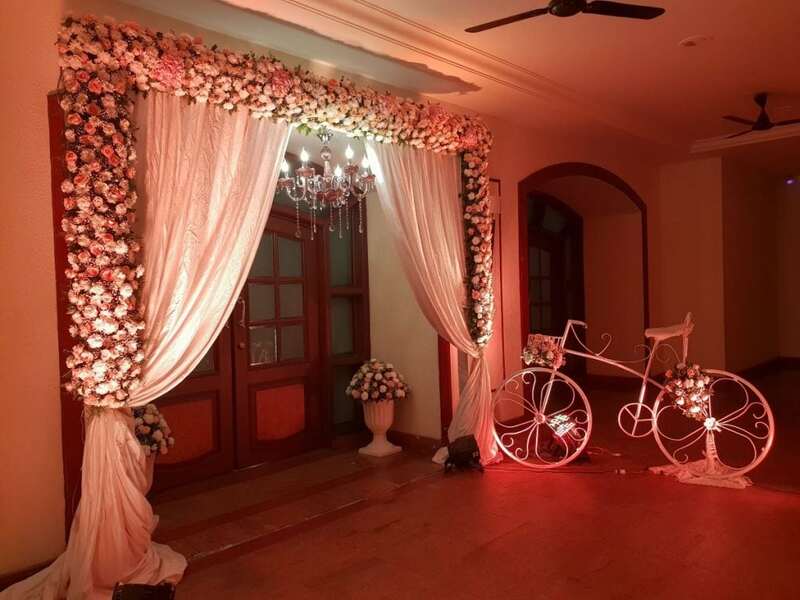 It also has good indoor venues to choose from namely Rajbaga and Braganza Ballroom. The property has well-maintained rooms and outdoor spaces. However, since its such a huge property you will end up noticing areas that are run down and not up to the mark. Also as it is a huge property, one might feel a bit lost in its vast expanse. Pros: Huge property, beautiful wedding venues, multiple options of venues to choose from, nice Ballrooms, spacious rooms, good food, good brand value. Cons: More 2 hour drive from the airport and station and too huge a property as guest might feel lost with its vastness. Also a bit run down and dark in some corners. 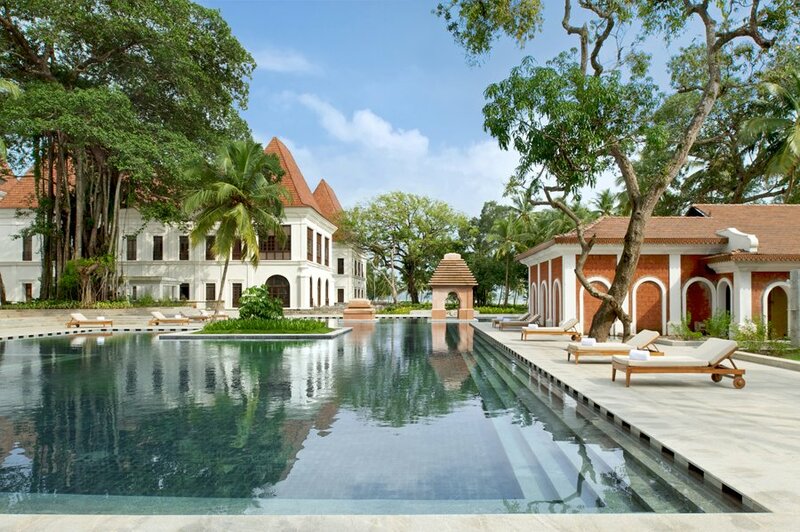 Alila Diwa is a boutique property with 153 rooms. Personally I love the contemporary and off beat charm of the venue. Its different from all the other hotels in Goa. Alila also serves great food and you’d have to give them an extra brownie point for presentation of their menu spread. However, in my opinion it is not the most suitable wedding venue. While it has a gorgeous infinity pool that can be used for your pool party. The pool deck is ideal for a wedding. However, their ballroom can fit a maximum of 150-200 guests comfortably. Also their lawn is surrounded by walls on all sides with no view, making you feel like you’re getting married in a backyard of a cottage. Moreover, its not a beach property and one has to travel for 10-15 mins away from the venue if they wish to have a beach wedding. Pros: Charming Venue with THE BEST BEDROOMS in all of Goa. Cons: Not ideal for weddings due to lack of good venues. Planet Hollywood is a new property that launched in mid 2015. It has 115 rooms and is perfect for a wedding of 200-350 guests. 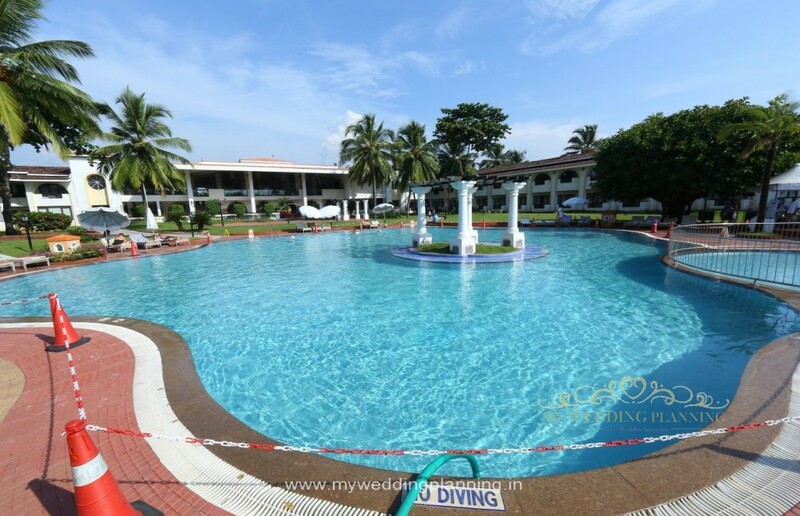 It has a beach that’s ideal for a wedding, beach facing lawns, an amazing pool which is their USP. It also has a fantastic high-celling Ballroom which is sound proof. Gauri Khan has done up their lobby and the property has a Hollywood theme that runs through the entire venue. Rooms also have Hollywood caricatures and posters. Rooms are modern and have hi-tech equipment and mood lighting. Cons: The Hollywood theme may not go down well with everyone. Also the lobby is not grand.